The Twin Ultra greywater recycling system uses membrane filtration and can recycle 70% to 90% of greywater used in commercial and industrial laundry operations and other applications not requiring potable water. 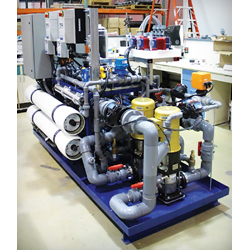 The technology offers filtration path stability and reduced maintenance and operator time. The computer-controlled system continuously monitors the water quality at various points through the filtration process, making real-time adjustments to ensure consistent quality in the filtered water output.